The CEOs of GM, Chrysler, and Ford returned to Washington, DC today to ask again for a federal bailout of their companies. They left their private jets at home. How much gas does $1 buy these days anyway? Maybe this will focus the minds of Detroit's big three automakers on producing more fuel efficient vehicles. 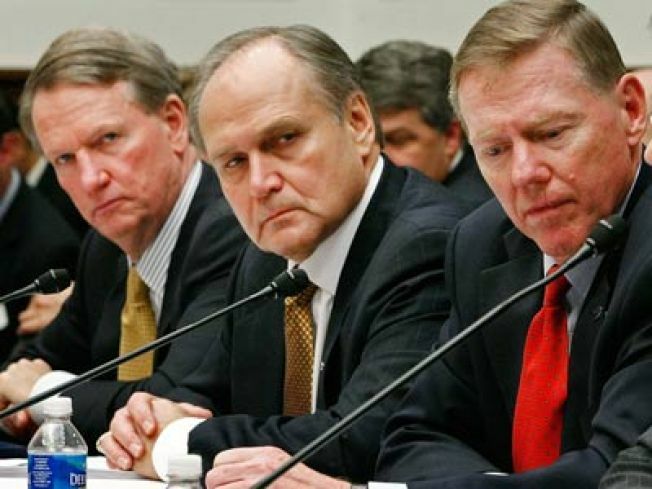 Rick Wagoner of GM, Robert Nardelli of Chrysler, and Alan Mullaly of Ford all promised that they only draw a symbolic $1 of salary next year if Congress bails out their flailing companies. The three CEOs want another $25 billion they claim is necessary for their companies to survive. Wagoner and Mullaly took home total compensation of $14.4 million and $21.7 million, respectively, in 2007 according to CNN. Chrysler is a closely held company and does not disclose executive compensation. Hopefully, the three execs have saved some cash to scrape through 2009 on a meager $1--although it's possible they could file for public assistance. That's exactly what they're doing this week in front of Congress--requesting billions in federal bailout bucks to rescue their companies, which are hemorrhaging cash so quickly that GM says it could be broke sometime next year if business doesn't turn around. The failure of the big three automakers could cause a ripple effect that would adversely impact their suppliers as well. Wagoner and Mullaly will both drive to DC in hybrid vehicles in a bit of damage control after all three executives were roundly criticized for flying company-owned private jets for their prior trip to beg with hats in hand for taxpayer money. Nardelli's travel arrangements weren't publicized for security reasons, according to MSNBC, but Chrysler said that its CEO would not be taking one of the company planes to the meeting. The paucity of information on how they were going to turn their companies around the last time they appeared before Congress was enough to merit a skewering on Saturday Night Live. Ford's Mullaly announced today that the company may not even need a bailout and that Ford has enough cash to carry it all the way through 2009. The financial markets responded positively to the news.